EXCLUSIVELY AT NEIMAN MARCUS Hand quilted comforter with cord edge. Face, polyester/viscose. Cotton backing. Dry clean. 90" x 95". Made in the USA of imported materials. Comforter set made of polyester, rayon, and cotton. Set includes a corded comforter, two braided and corded shams, and a shirred and banded dust skirt. Dry clean. Handmade in the USA of imported materials. EXCLUSIVELY AT NEIMAN MARCUS Set includes one comforter and two pieced shams. Hand-quilted jacquard comforter. Main: polyester/rayon. Backing: cotton. Trims: polyester. Diamond back. Zip closure. Dry clean. Comforter: 90" x 95". Made in the USA of imported materials. 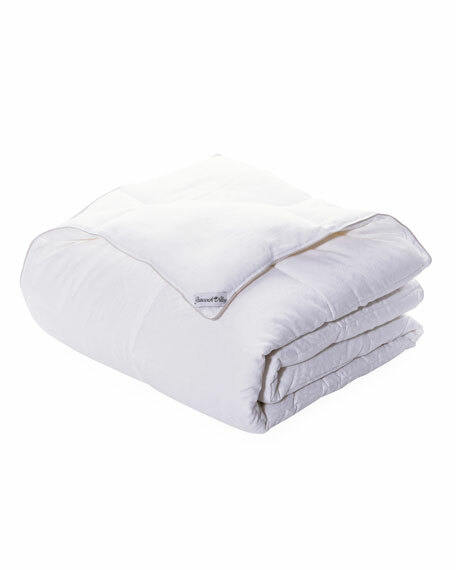 Four-piece set includes: one 110" x 96" comforter, two 20" x 26" shams and one 72" x 84" dust skirt with 18" drop. 300-three count cotton sateen face. 200-three count cotton sateen reverse. Polyester fiber fill. Machine wash. Imported.